Metallica as you know has been selected to be inducted into the Rock and Roll Hall of Fame (on April 4th). So, it is with much respect that I say congratulations! Judas Priest so I will be unable to attend. 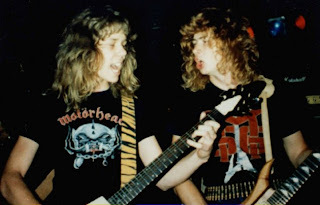 However, I'd like to say to Lars (Ulrich) and James (Hetfield); I am so very proud of all you have accomplished. I will continue to pray for the very best for you and your families as I always have. Thank you for the invitation and thinking of me. Rendez vous à Paris le 1 et 2 avril pour voir Metallica sur la scène de Bercy.